Southern Illinois University Edwardsville’s Department of Applied Health in the School of Education, Health and Human Behavior now offers a bachelor’s in nutrition, an academic program that places emphasis on the relationships between nutrients and human health. A class students are finding especially unique is the program’s Food and Culture course. It’s a health experience elective that offers students a special “taste” of diversity in food. “Our goal is to broaden students’ perspectives,” said Jennifer Zuercher, PhD, RD, assistant professor and nutrition program director. “Cooking and sampling foods that students may not have ever tried or prepared before helps participants better understand, appreciate and engage in the cultures that we’re learning about. “The course offers an opportunity to consider food as a symbol of social hierarchy and individual identity, food as part of religious and moral practices, and food as a part of migration and movement,” she added. Throughout the course, the classroom transforms into a kitchen and taste testing begins. Participating students make authentic Native American, Japanese, Chinese, Pacific Island and French cuisine. The course features presentations from international faculty and community members, who share their integrated experiences. Students are required to eat a type of ethnic food they’ve never tried and reflect on the experience. It also aims to teach students how the culture of food attitudes and behaviors affect the counseling strategies of healthcare professionals. It provides an opportunity to learn within and beyond the classroom, holding true to SIUE’s value of excellence. “With the increasing diversity among the U.S. population, it is important not only for nutrition practitioners, but also other other healthcare providers, business people and professionals to gain a basic understanding about different cultures in order to gain acceptance from and build trust with clients,” Zuercher said. 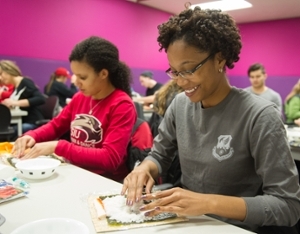 Photo: Ciera Bryant, a sophomore majoring in nutrition makes sushi during the Food and Culture course. 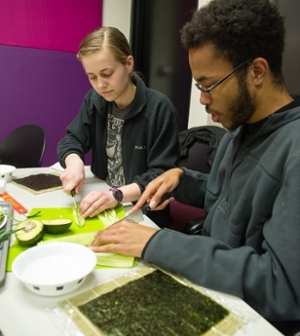 SIUE students Tess Brown (L) and Justin McCloud (R) slice ingredients for their sushi rolls.